Your dog is snapping, biting, charging, growling or worse …. You’re walking the dog late at night and early in the morning to avoid other dogs …. You’re embarrassed and tired and don’t know what to do …. Aggression is one of the most difficult behaviors to correctly diagnose and correctly modify. I have over 20 years’ experience with aggression in all its forms. Don’t give up yet, give me a call. Let me offer an opinion. I want to help. Anti-aggression work is the cornerstone and pillar of our training. We train pups and owners from a young age how to build drives correctly, communicate the right way, and build an unshakeable bond with their handlers. It is easy to make an error and it is not your fault. We can fix it, with time and dedicated training. 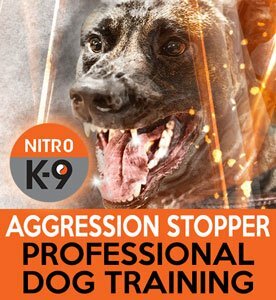 Over the years, I have trained hundreds of aggressive and reactive dogs to a full recovery or manageable state. My extensive experience with working dogs both with law enforcement and in the private sector gives me a unique insight into this behavior and a deep understanding of the who, what, when, where and why. In my experience, most truly aggressive dogs are primarily aggressive or reactive on the leash. Many dogs are labeled as aggressive, but are really only mildly reactive and are quite easy to train, but they far too often slip through the hands of many, many local trainers. I routinely help these people, who are told that there is no hope for that dog just because a trainer’s personal and misguided ideology is more important than using the right tools and techniques to rehabilitate a dog. I am a professional handler. I do not use food for behavior and I do not separate a dog from other dogs because of his or her reactions. This is an approach that works. We do it every single day. Even more, we teach YOU how manage your dog. Many of my clients have gone to anti-aggression training, but weren’t allowed to bring their own dog. How can you modify behavior if you aren’t allowed to work with your dog? I have heard of trainers charging hundreds of dollars for an “evaluation”—and then recommending a full training course. Nothing is more important to me than helping people like you overcome your difficulties. I want to emphasize that you are not alone. Others are suffering and fighting to reclaim their dogs as well. I am not going to promise you the world. But I am going to tell you what I honestly think and create a unique training program for you and your dog to go through. As long as you work with your dog every day, it is very likely that you start seeing improvement from the very first lesson. We resolve issues through foundational obedience training. As a professional dog handler, I can tell you that proper training cures most things that are wrong. A well-trained and well-focused dog can and will choose to ignore old habits and conform to new expectations. I am not going to lie. This is not easy and it takes work. But it can be done. The very first step is throwing away the food and clickers. In my experience, this type of training fosters a very unhealthy relationship between dog and handler. When foundational obedience is built on food, dogs rarely, if ever, develop a full relationship with their owners. At first, using food to “counter condition” a puppy or young dog may seem to work, but it will often fail when the dog is full grown and reacting at full power. Also, do you want your dog to focus on you—or on food? The other issue with “positive” approaches is that clicker/marker training needs to have absolutely perfect timing, which the vast majority of people (including many trainers) don’t have. If you’re teaching tricks, it’s not a big deal. But when trying to work on aggression or reactivity many people end up reinforcing the wrong behavior. We see this all the time—and we fix it all the time too. Trust me on this one: we can show you a better way. Please read our testimonials. Most are about how we have saved aggressive dogs. My clients have such a dramatically high success rate for one simple reason: they train and work hard every day, which builds a solid bond. They earn the respect of their dog and their dog learns to respect them again. You can get your sweet boy or girl back. We do NOT charge more to work with aggressive dogs and we never will. Our pricing is the same for Level 1 obedience training, with a slightly higher evaluation cost (this is to cover insurance). For dogs that are over 35 pounds, see Level 1 for Obedience for Big Dogs. For dogs that are under 35 pounds, see Level 1 for Obedience for Small Dogs. We need 20 minutes of your time and the proper paperwork.